Looking for Me Sooo Comfy® - Navy in Full, Full XL, Queen, or King sizes? Make your Twin XL sized bed the softest one on campus with our amazing Me Sooo Comfy Twin XL Sheets - Navy! These insanely comfortable dorm room sheets are definitely oh so comfy. The unique coral fleece material used to make these cozy college sheets is one of a kind! 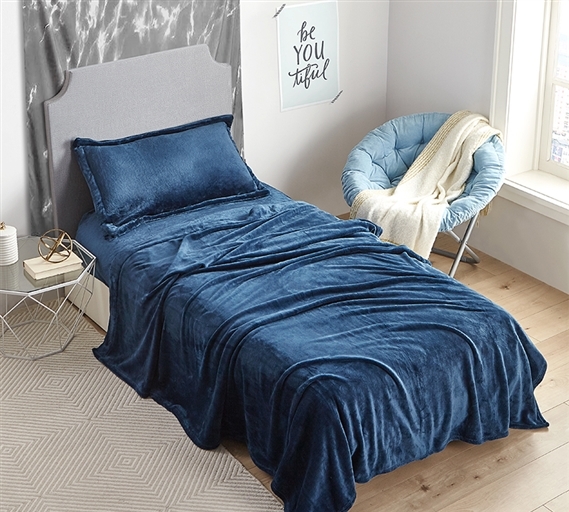 This Twin XL sheet set includes a flat oversized Twin XL sheet, a Twin XL fitted sheet, and a matching pillowcase, so you can completely surround yourself with this ultra plush college bedding. These thick and cozy plush dorm sheets are ridiculously comfortable, just make sure you can get out of them in time for class! But your dorm bedding doesn't have to be just about comfort, even though comfort is an essential part of your Twin XL size bed. Fortunately, these one of a kind extra long Twin sheets are also a unique way to add style to your dorm room. The alluring navy blue color of this Twin XL sheet set will will give your dorm room a valuable burst of color. Twin extra long bedding that is stylish and comfortable is an essential part of any college dorm room.